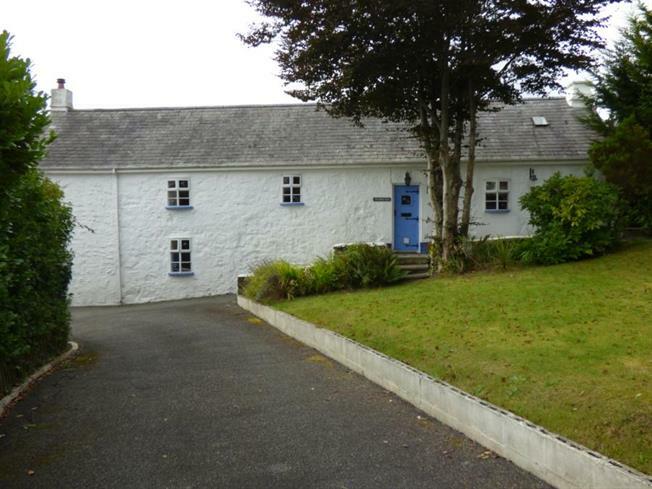 4 Bedroom Detached House For Sale in Gwynedd for Offers in the region of £600,000. An historic period detached residence with immence character, originally the home of Dr John Owen, bishop of St David's who was born in August 1854, with a commemorative plaque displayed to the gable end of the cottage. The property retains a host of original features with re furbished four bedroom family accomodation with the installation of propane gas fired central heating, a newly installed kitchen and a modern bathroom. A particular feature being the splendid living/dining area, filled with character and exposed vaulted beamed ceilings. Leading off the living room is a delightful secluded balcony enjoying the wonderful views across the golf course towards Cardigan Bay in the distance. There are two bedrooms to the ground floor with two further bedrooms to the lower ground floor with a shower and utility room. A stairway from the hallway leads upto a spacious crog loft bedroom. Externally there is a long driveway with vehicular parking to the side elevation, lawned to the front garden with paved terraced areas to the rear. The highly acclaimed seaside village of Abersoch with it's excellent array of facilities is within 0.5 miles walking distance into the centre.